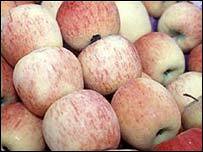 Children of mothers who eat plenty of apples during pregnancy are less likely to develop asthma, research suggests. The University of Aberdeen project quizzed 2,000 mothers-to-be on their eating habits, then looked at their child's health over five years. They found that those who ate four or more apples a week were half as likely to have an asthmatic child compared with those who ate one or fewer. The study was presented at the American Thoracic Society conference. The researchers also found a link between eating more fish in pregnancy, and a lower chance of their child developing the allergic skin condition eczema. Women who ate one or more portions of any type of fish during pregnancy weekly had almost half the chance of having a child diagnosed with eczema within the first five years. There are no firm clues as to why apples and fish might be able to produce this benefit - no other foodstuffs were linked to decreases in asthma or eczema. However, apples are already linked to better lung health when taken by adults, perhaps due to their antioxidant properties, and oily fish in particular contain Omega-3 oils, which, it has been suggested, offer health benefits. It is, however, notoriously difficult to uncover links between maternal diet and child health, given the numerous other factors which may be involved in the development of diseases such as asthma and eczema. The Aberdeen team has a group of 2,000 women, who, more than five years ago, monitored their food intake during pregnancy, and then allowed researchers to see what happened to their children. The project, funded by the charity Asthma UK, has previously revealed links between vitamin consumption in pregnancy and lower levels of asthma. This time, they feel that while the apparently strong link between apples and asthma does not prove that eating the fruit is the cause of lower asthma rates in children, it does offer a strong argument for a balanced diet during pregnancy. Dr Graham Devereux, one of the lead researchers, said: "There may well be another factor in the lifestyles of women who eat lots of apples that is influencing this result. "But it is certainly a clear association, and it is certainly less controversial to encourage women to eat more fruit during pregnancy rather than to take extra vitamins." Dr Victoria King, Research Development Manager at Asthma UK says: 'This study suggests a simple modification that can be made to a pregnant mother's diet which may help protect her child from developing asthma before the age of five. "The study supports our advice to pregnant mothers to eat a healthy, balanced diet.